Filopodia (singular filopodium) are thin membrane protrusions that act as antennae for a cell to probe the surrounding environment . Nonprotruding filopodia are mechanistically related to microspikes . Filopodia are commonly found embedded within, or protruding from the lamelliopodium at the free front of migratory tissue sheets. Filopodia are also prominent in neurite growth cones and individual cells such as fibroblasts. 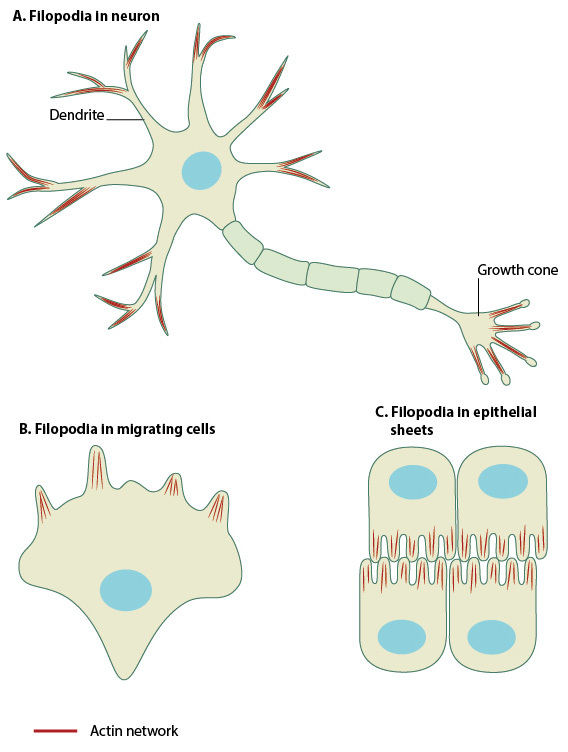 Filopodia are found in neurons (A), at the protruding edge in migrating cells (B), and in epithelial sheets (C). Filopodia are 60-200 nm in diameter and contain parallel bundles of 10-30 actin filaments held together by actin-binding proteins (e.g. fascin). These filaments are oriented so that their barbed end is directed towards the protruding membrane. Filopodia sense the extracellular environment at their tips using cell surface receptors . Contact with an external target promotes the coupling of membrane-bound proteins to the backward (retrograde) flow of actin; this coupling produces the pulling forces needed for cell migration processes such as wound healing and neurite growth . Contact differences between substrates or cell types influences the number of protruding filopodia . A key set of proteins is involved in filopodia formation; however, the relative importance of each protein seems to vary between different organisms and their cell types. Three basic steps are involved in filopodial assembly: filament nucleation, sustained barbed end elongation and filament bundling. Filopodia are dynamic structures that are primarily composed of F-actin bundles and whose initiation and elongation are precisely regulated by the rate of actin filament assembly, convergence and cross-linking. Filopodia undergo 9 distinct steps in their formation. Double-sided arrows symbolize the ability of a filopodium to oscillate between different states. 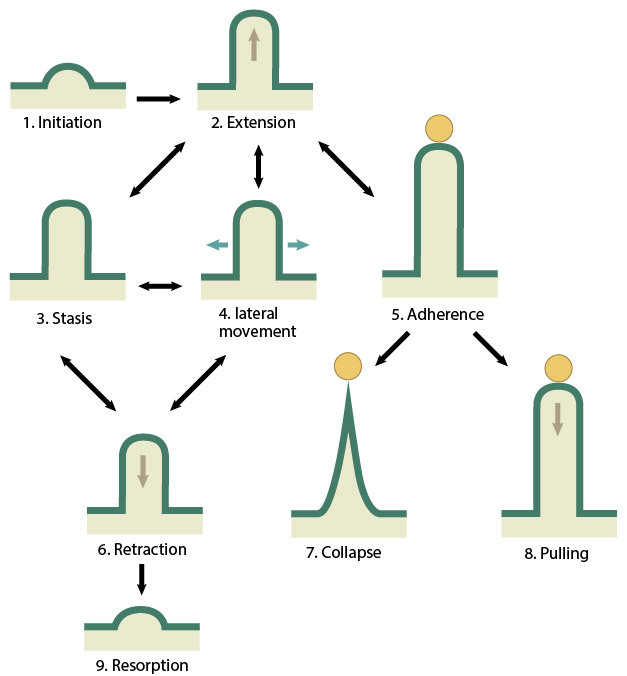 The actin treadmilling mechanism of elongation is essential in protrusion  and any change in the frequency of initiation, or the balance of extension versus retraction of actin filaments, can result in the gain or loss of filopodia. Filopodial actin filaments are unbranched , and observations of filopodial formation have revealed that actin assembles at the filopodial tips, moves backwards, and dissipates at the rear . 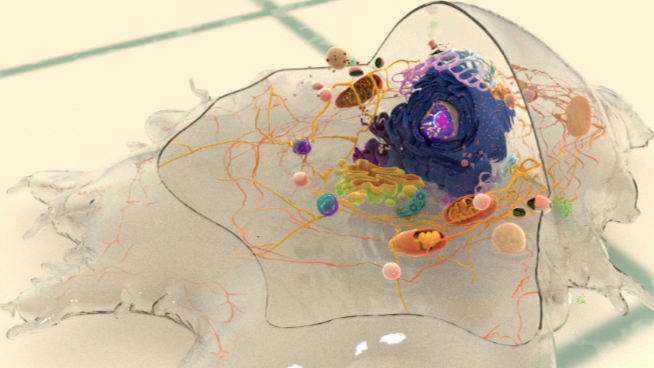 A complete model for how a filopodium is formed has recently been reviewed .